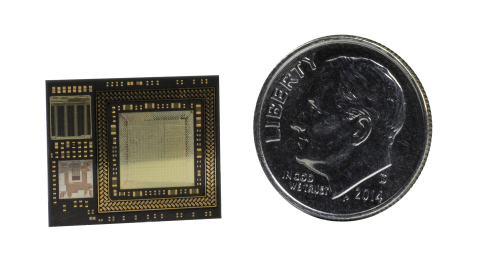 AUSTIN, Texas--(BUSINESS WIRE)--(Freescale Technology Forum 2015) – Freescale Semiconductor (NYSE: FSL) has introduced the world’s smallest single chip module (SCM) for the Internet of Things (IoT). As the IoT requires more processing horsepower to be packed into ever smaller spaces, Freescale’s new SCM line of products can integrate hundreds of components including processors, memory, power management and RF parts, which would otherwise be deployed on a six-inch board, into a tiny 17mm X 14mm X 1.7mm package – the size of a U.S. dime. Today at the Freescale Technology Forum (FTF) in Austin, Texas, Freescale unveiled the first product in its new SCM portfolio. Designed to function as a computer on a chip, the i.MX 6Dual SCM is enabled for DDR memory and combines the performance of Freescale’s i.MX 6Dual applications processor together with a power management integrated circuit (PMIC), flash memory, embedded software/firmware, and system-level security technology including random number generation, cryptographic cipher engines and tamper prevention. SCM products are engineered to dramatically reduce time-to-market, allowing an estimated 25 percent reduction in hardware development time – as well as greater than 50 percent reduction in size versus current discrete solutions. The module’s exceptional performance and connectivity allow customers targeting IoT markets to incorporate sophisticated predictive data analytics capabilities into their products, allowing for highly compelling and potentially disruptive end-products. Freescale’s SCM modules are ideal for applications such as 3D gaming goggles, where battery life and power are important; next-generation IoT drones requiring extreme processing performance for object recognition; and other IoT products, where highly advanced graphics and user interfaces are considered key to more mainstream adoption. Other markets well suited for Freescale’s SCM technology include wearables, next-generation medical equipment and autonomous sensing applications. Freescale’s SCM portfolio products are delivered as a fully tested and software-enabled platform for consumer and industrial applications. They feature optimized board support package stacks and are enabled for both Linux and Android. The i.MX 6Dual SCM is planned for availability in August 2015 directly from Freescale, and through Arrow Electronics distribution. Additional products in the SCM product roadmap are planned for release over the next two years. Freescale’s software/hardware solutions teams and a number of SCM ecosystem partners enable fully embedded component sourcing and enhanced design support to reduce supply chain complexity and overcome development challenges. For ten years, the Freescale Technology Forum (FTF) has driven innovation and collaboration by featuring one of the most comprehensive embedded ecosystems in the industry. FTF provides the training and expertise customers need to create and enable the secure, embedded solutions needed for the Internet of Things – today and tomorrow. FTF features four days of in-depth training, hands-on workshops, demonstrations from Freescale and ecosystem partners and exceptional opportunities to collaborate with industry peers and visionaries. The forum has been enthusiastically received by the global developer community, drawing nearly 70,000 attendees worldwide since its inception in 2005. FTF takes place June 22-25, 2015, in Austin, Texas. The keynotes will be available by live stream. Don't miss out – save the dates to your calendar. Freescale, the Freescale logo, and i.MX are trademarks of Freescale Semiconductor, Inc., Reg. U.S. Pat. & Tm. Off. All product or service names are the property of their respective owners. All rights reserved. © 2015 Freescale Semiconductor, Inc.